Beach: Steps to Maushop Village Beach. 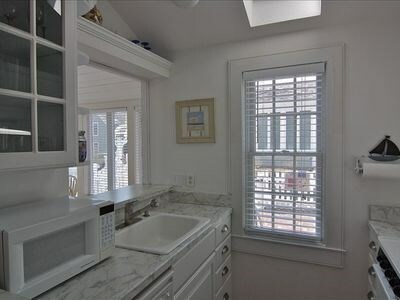 Fabulous 2 bedroom, 2 bathroom beach cottage with ocean views in the desirable Maushop Village of New Seabury. Just steps to your own private beach! 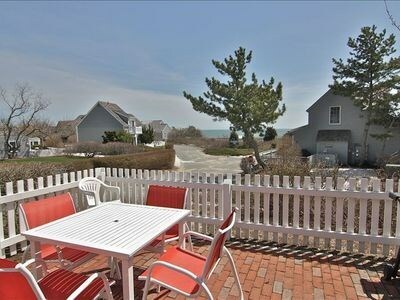 Walking distance to the Popponesset Marketplace and Popponesset Inn. Minutes to restaurants, live music, spectacular shopping, golf, swimming, tennis, bike trails, hiking. Just a short distance from Mashpee Commons conveniently located for day trips to other Cape towns and the Islands. All linens, internet, cable TV and other amenities are provided. This is the vacation you have always dreamed about! During the summer months (July/August) it is rented by the week from Sat. to Sat. Nearest beach: Steps to Maushop Village Beach. Additional pricing info: $150.00 cleaning fee for each rental period. State and local taxes of 12.45% will apply. This condo is so cute and fit our needs perfectly. It is close to shops and restaurants. The view of the beach is absolutely beautiful. We will definitely consider staying again. 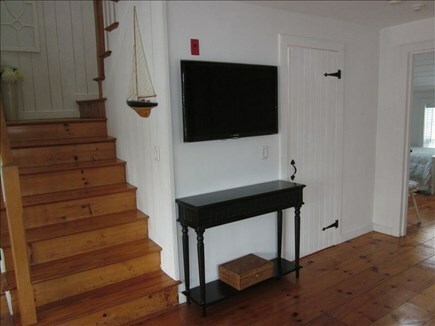 Charming cottage with view of Nantucket Bay and nice stroll to beach. Home very clean, well stocked and tastefully decorated. Just bring your toothbrush and clothes. Kitchen compact and efficient. Location catches nice breezes for comfortable sleeping. Owners very helpful and responsive. Thank you to both. Clean, quiet, well equipped, excellent vacation location. It was a beautiful Condo with an Ocean Veiw and 2 minute walk to the beach. Loved my time there. Very relaxing and beautiful setting. It was a perfect get away! 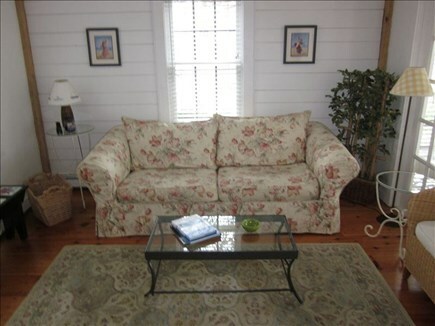 The condo was extremely well cared for and had everything you need for a beach vacation. Great location and layout. Breezy and clean. One week wasn't enough. We just got back home from from our week long vacation here at the ocean & I am still looking at the photos of our ocean village rental ~still "honeymooning" over our stay my family experienced here in Maushop Village. The condo is an end unit (though it did not feel at all like it was a condo for it was very private and like a cozy home) with beautiful views of the ocean, as well as the picturesque cottage village with flower gardens everywhere! The photos of the rental were attractive, but can not prepare you for the actual beauty & experience of this treasure along the Nantucket Sound. The owners are very helpful & responsive to any need, they have tastefully & thoughtfully decorated the house and added surprise areas of literature to enjoy & an assortment of family games. FYI- the binoculars that were found among the interests were a favorite to use at the beach & the whale watch! We walked to the Market Place with our 4 & 6 yr olds, enjoyed live music and excellent seafood, icecream & boutique shopping! We made memories that will last a lifetime and had me wishing my Dad were here with me. We hope to be back next season! Thank you!! Perfect family getaway- everything we needed! This was the perfect long weekend getaway for our family. We have three small children (5, 3 and 4 months) and found the cottage to have everything we needed. It was comfortable, cozy and having a washer/dryer was a life saver! There were games and beach toys for the kids, extra blankets for sitting outside at night and a well equipped kitchen. We loved the closeness to the beach and enjoyed many walks and daily sunrises! Such a splendid spot, wonderful and accommodating hosts (they even mailed us our son's forgotten sock!) We hope to visit again next fall. Recommended for: Families with Young Children, Romantic Getaway. Jeff and Eileen have owned the condo since 2003 and moved to Mashpee after retirement in 2009. Jeff was a pilot in the USAF from 1967 to 1988. He retired from a Sunoco in 2009 as the Aviation Director for their corporate flight department. They have 3 sons and 6 grandchildren. 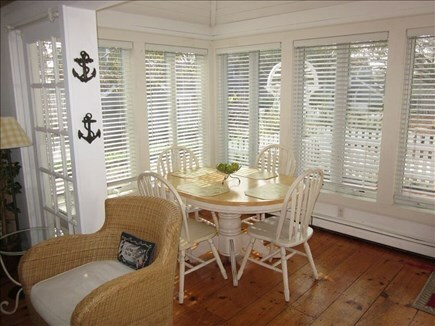 Our condo is located in the lovely village of Maushop which is fashioned after a quaint Nantucket fishing village. 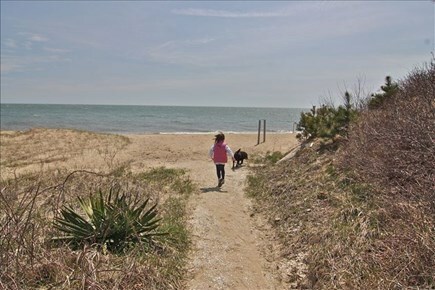 There is a private sandy beach only a minute walk that is on Nantucket Sound. It is quiet and clean. The condo has water views from the patio and the upstairs bedroom, and peek at the water from the sun room and living room. 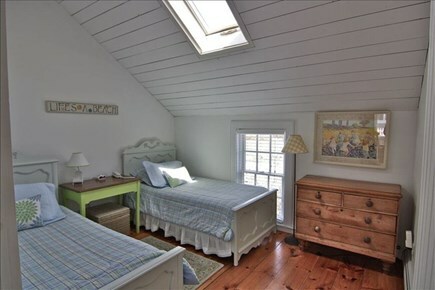 We have a queen bed upstairs with a full bathroom and a set of twin beds in the downstairs bedroom. 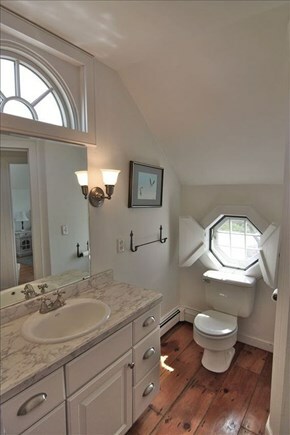 There is a full bathroom downstairs with a tub and shower. 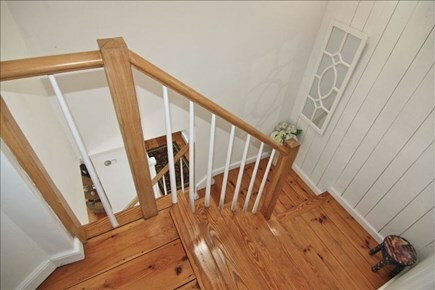 We are only a short walk to the Popponesset Marketplace and the Popponesset Inn. 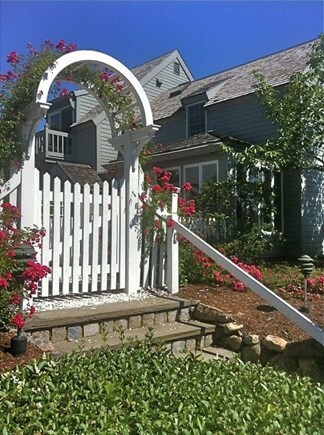 It is only a few minutes drive to Mashpee Commons which has numerous shops and restaurants. 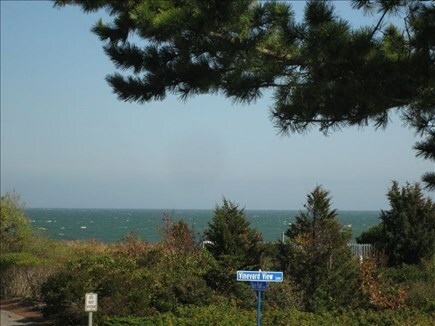 New Seabury, which Maushop village is part of, is a family oriented community located on Nantucket Sound. 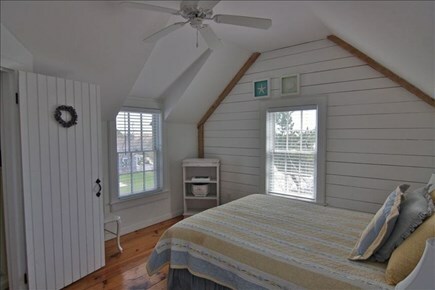 It is centrally located which lets you drive to all the various towns and villages on the Cape. It is only about 20 to 30 minute drive to the Matha's Vineyard and Nantucket ferry boats. There are many activities year round for every taste.